For once, you can get pinched in the virtual world. While some companies are trying to make AR and VR more immersive via haptic feedback, one startup decided to focus on the thermal aspects of the experience. 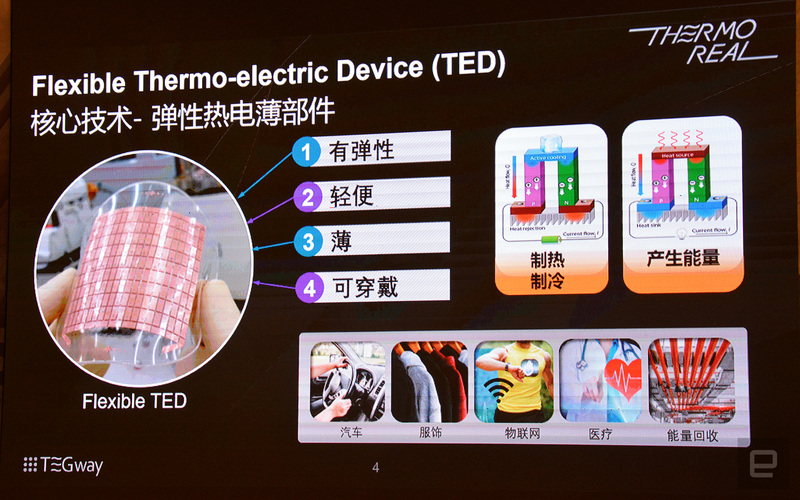 TEGway, a spin-off of the Korea Advanced Institute of Science and Technology, has created a slim, flexible thermo-electric device (or "TED" in short) that can rapidly heat up or cool down, covering a temperature range of 4 to 40 degrees Celsius (39.2 to 104 degrees Fahrenheit). Better yet, it can simultaneously produce both heat and cold in different zones on the same surface, which enables the simulation of a pinch on one's skin to produce pain. Now packaged as ThermoReal, the company is hoping hardware makers will integrate this solution into the likes of joysticks, gloves, haptic suits, chairs and more for a new level of immersiveness. In a nutshell, a TED works by running an electric current through its array of thermoelectric semiconductor, which would create a heat flow between the top and bottom substrate layers and thus making it behave like a heater or cooler. But it's actually better known for its reverse process: a temperature difference applied to the semiconductor can induce a current flow (this phenomenon is called the Seebeck effect), in which case the TED acts as a power generator and can therefore be used for harvesting waste heat. In order to optimize the efficiency of capturing heat on non-flat surfaces, TEGway found a way to develop flexible TED. Not only does this have better energy harvesting performance than its ceramic counterpart, the company also found a new use case for it: adding realism to gaming using thermal feedback, hence "ThermoReal." It just so happened that by applying one line of heat in parallel to one line of cold, this creates the sensation of a nasty pinch, so ThermoReal also serves as a weak self-torturing device. At TEGway's HTC Vive X demo day booth in Shanghai, I first tried a demo where I held onto a stick partially wrapped with a TED, and the whole apparatus was linked up to a laptop which was running ThermoReal's showcase software. For the cold simulation, I watched a video of a man slowly dipping himself into icy water, and the deeper he went, the colder the stick became -- to the point where I almost felt sorry for the man. To show off its fast thermal response, the stick's temperature also fluctuated ever so slightly to correspond with the man bobbing his head in and out of the water. In a more impressive simulation, while I was watching a candle flame being slowly moved towards a hand in the video, I felt an intense heat spot running across my fingertips in the same manner. It was scarily real, so I was very relieved when the candle flame was replaced with an ice cube in the video. Again, the simulation was quite convincing, but I could be biased in that instance. Then came the pinch: at first I could feel a hot line and a cold line building up in parallel, and within about a second or two it turned into a sharp pain on my palm. It was as if a bug had broken out of the stick to give me a nasty bite. It felt real but definitely not enjoyable, so it didn't take long before I let go of the stick. I then proceeded to TEGway's AR demo. 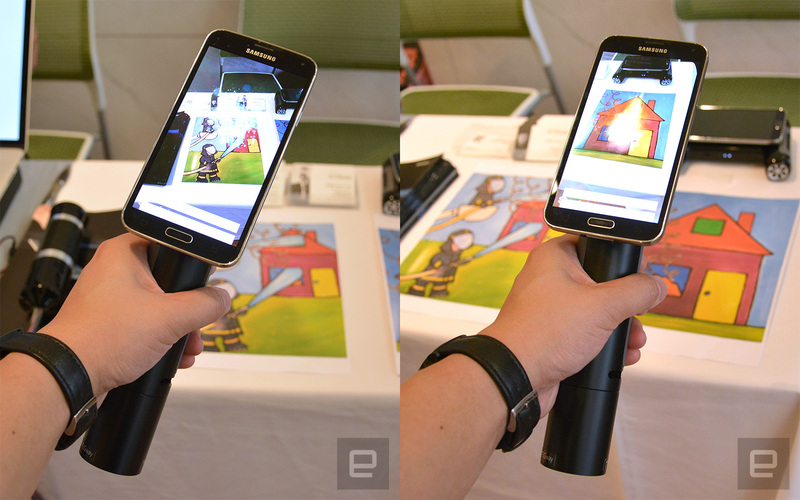 This time there was a smartphone attached to a battery-powered TED stick, with the former running an AR app to recognise two drawings: one showed a house on fire, while the other showed two firefighters blasting water at same scene. With the first picture, the AR app mapped a virtual flame on top of the house while the TED became hot; and with the second drawing, the app showed splashes of water on the house while the TED became cool. Last but not least, I was given a gamepad with a TED taped around its left and right grips. 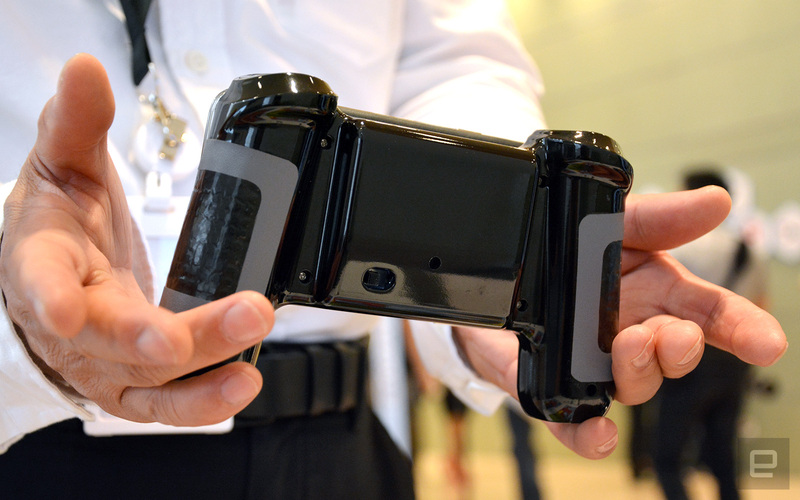 The gamepad was paired with a smartphone running a mockup jet fighter game, and it's basically the same deal: the TED instantaneously heated up whenever the aircraft sprayed fire through its exhausts, and it rapidly cooled down when it sprayed mist or whatever it was for deceleration. All in all, ThermoReal works surprisingly well, so it's now down to TEGway to convince manufacturers to adapt its solution. On the software side, the company will be licensing software patches to content creators. It's a bit of a chicken and egg situation, but hopefully it won't be too long before we see this technology featured on consumer devices.